Species: Lyghyrvvyrm, Liar Wyrm; a curious half-breed species which possess a rampant need to lie about the smallest, to the largest, things. 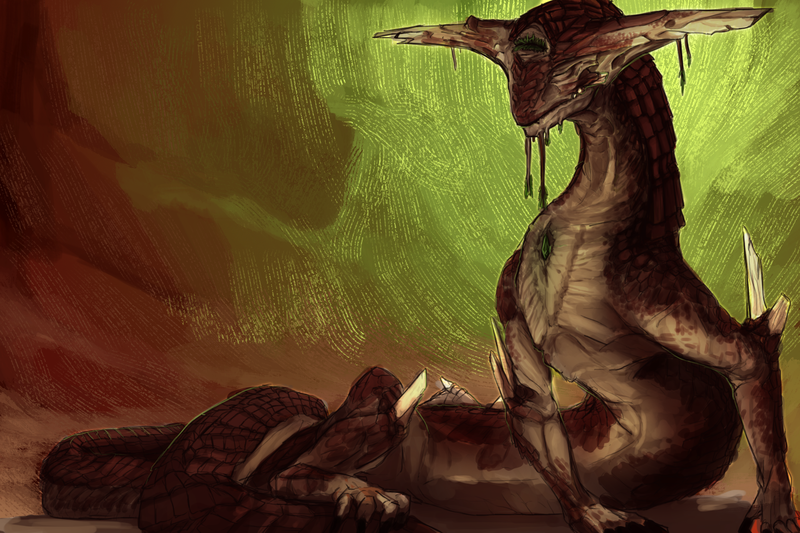 A need borne from an Eastern Dragon’s wit and mind, and the Wyrm’s rather, typical,lack therein. Personality: Grace, guile, and guts are the simplest, perhaps the most ironic, traits that define Laaghuz. For all his slimesome poise and sly ways, he is bold and confident; which oft play into his tricks and games. Games of which, never seemed to end for Laaghuz, as his jubilant temperament seem to impress a sense of haphazardness, despite his otherwise regal demeanour. However, he tries to hold a nugget of truth in every lie; he is only ever curious and playful, never utterly, malicious. Though, his antics have a terribly inconvenient habit of turning up foul for those who play with Laaghuz. It is always unintentional, that’s a promise. Hobbies:When Laaghuz is not busy pondering in the dark, dank caves he delights in growing all measures of fungus and moss in his lair. He has a love for things that glow and twinkle, so he collects them. Curiously, despite his poor eyesight, he is surprisingly deft at carvings and pottery. He also tends to his teeth, nails, scales, and horns with the utmost care. Art : Years of muddling about in the dark has left him wanting and yearning for the intricate details hes found only later in Life. There is little else that excites him more than a piece of art. Wisdom : His years of a recluse have left him curious to the ponderings of other entities. He is convinced everything has a piece of wisdom in it, from a stone to a moth to a Drake. Water & Storms : The applause of rainfall, the roaring thunder, the whispering winds and the trickling stream were the first voices Laaghuz heard; despite his hardship, he finds sanctuary in these humblest of choruses. Cooking & Brewing : It was necessary for survival, at first. But now it is for pleasure; he delights in a newfound mushroom or fungus or fish. Ever curious as to what he can stick into a pot. Moss, Moths & Fish : He had few friends in his youth, he was raised by these creatures that lingered in the caves he had been born in. Fire, Soft Glows, Shiny Things : Laaghuz will never forget the first time he spied a glowing mushroom, bringing an end to his tenebris existence. Violence : Though he’s not disposed to partaking, he will always pursue the quickest end to such forrays. Life is no precious thing to be squandered. Bright Lights, Loud Noises & Cloudless Skies : The brightness of a full sun burns his eyes and hide, the crack of lightning and rumble of an earthquake all brought woe upon Laaghuz. And Cloudless Skies, perhaps most of all, bring a scowl to his snout; how is he to know how high to fly if there is no ceiling? Sand, Mud, Grime & Birds : It is coarse, rough, and gets everywhere; it is a pain to clean and the last thing Laaghuz wants is to be disgusted by his own reflection. Cowardness in the face of Death : It seems so far away yet… there are bones of creatures smaller than Laaghuz in the caves he’d roamed. How long will he last? And, when it comes… will he be ready? These things… They sour the soup. His Lies & Losing his Wit : At times, his tongue spits words he’d never mean to say. So far, they’ve kept him alive. But that will end someday, everything ends. Laaghuz fears what might become of his mind, as the years begin to take their toll; a kettle’s coals will not burn forever. Sleep, Sickness & The Cold : In the Dark, it was cold… Laaghuz had long endured it, but with freedom now seized, he is loathe to return again. He has seen ailments befall the creatures, the rats and cats and bears what roamed his lair; he’d been stricken once with illness, and he lived but by luck alone... And for sleep… Why would he ever willingly embrace the Dark? Fear it, as fish fear the brine. Bears & Moles: One is dangerous and biting, and loud. The other… simply bizarre and unexpected; both with short fur, greasy, wet… They hurt Laaghuz’ dear fish and stomp about his mushrooms and scrape off the moss of his lair. Brusque as a Bear, Meek as a Mole… Truly, the rudest insults Laaghuz would sling. Home: A small, slightly flooded, but confusing labyrinthe of caves along the shores at the mouth of the Jade River. History: Laaghuz first memories are waking in a cold dark tunnel, he still has troubles deciphering what was a dream and what was reality in his youth, before the light, such was the Dark. He knows little of his parents, but they left carvings in hopes of guiding him, deep within the Labyrinth… Though Laaghuz has lost the location of these guiding runes. His life was simple, and closeted; for much of it, he was left wandering the Labyrinthian Lair left behind by his Mother, who hoped to hide Laaghuz from his Father. Laaghuz spent many years here, in the tunnels, and only learned to speak the most simple of tongues when he finally breached those dark confines and emerged on a beach of blinding light. Small, vagrant, Draconids found him and found him strange; they left him in the tunnels but his strange mannerisms often left them coming back time and time again, to both teach and pester. … Yet, in Laaghuz’ dreams, or nightmares, he hears their voices, such is how he got his name. “Laaghuz’Nhaedyrhjot, padn va verold innan ykkarr spordr.”, whispers the Voice of the Sea, whose words move like a river through a valley. Danger on either side, yet he is hidden in shadows. “Laaghuz’Nhaedyrhjot, veggr vaverold, haski hofdinaer. ", insists a Voice of the Earth, that trembles with strength and dignity, carrying the weight of worlds upon every note. Falling like a landslide, yet rolling as stones in a riverbed. , The Sea reminds, though as the waves of words fades, they both speak in a fading desperation. These dreams, nightmares… Memories, maybe, linger still and haunt Laaghuz when the world is waking and the seas are silent. It brings his eyes to the rising sun, when the Night is just beginning to fade. Deep in his heart, he knows to count each day. To treasure each moment. Deep in his heart, he knows the sun may not rise one day. Deep in his heart, he knows the Night may not fade. Accessories: Occasionally adorns himself with pots and containers held together by ropes draped about his neck and long tail. Horns/Spikes: On Laaghuz’ crown is a pair of long flat horns covered by thick leathery skin and scales in semblance to a hammerhead shark or an ox. His arms and legs boast horns that jut out from his joints. Overall Appearance: While most Draconic creatures stand with an imposing strength and innate regal air, Laaghuz’ crawls about with his long, spidery limbs; two long and lithe looking arms covered lightly in maroon hued scales reach out with rather impressive length, the elbow cocked back to better support his frame. These two arms, despite their length, and capacity to push himself up, are typically pulled up to allow his stronger, though shorter, hind legs to move about with some speed. Thankfully, his great length, of both body and arms, allow him to push his snakelike corpus up off the ground to a rather substantial height, especially considering his subterranean dwellings. Still, unlike most Draconids, Laaghuz boasts rather sparse scales; instead of scales about his paws, forearms, belly, and even his head, there is a simple thick and leathery hide. His lack of developed scales is owed, in large part, due to his crossbreed nature; his body growing exponentially faster than his scales have time to develop fully. While this leathery hide is strong enough to ward off most smaller creature’s strikes, such as bears and wolves, it will no doubt do little to stop a true Dragon’s swipe. Though, his own claws boast their own innate sharpness; his long digits at the end of his hands are capped with vermillion hued claws, that glimmer with a brilliant orange hue, not unlike the color of a sunrise. These claws are long and straight, with a sharp hook at the end. These hardened vermillion claws were designed to claw through stone, as much as scale and flesh. However, these claws are rather snubbed on his hind legs, where they typically pierce deep into the ground to brace him against earthquakes and tremors. Just behind Laaghuz’ upper row of teeth, is a nodule of flesh that can extend out from behind his teeth to shoot a single quill every odd hour(60 posts), though at varying degrees of hardness depending on how long the quill gestates. This quill can range from a sticky bramble, to a piercing bolt; both of which are shot out at very high speeds by Laaghuz’ lungs. By shutting the entrances of his nose, and opening the otherwise cinched passageway into his nostrils, he can shoot out the quill using the air stored in his lungs. He cannot fire this quill without first taking a breath, and its velocity is dependant on this stored breath. This quill is typically 4-8 feet in length, with a tapering corkscrewed width from 1 inch at the tip, to 8 at its widest, which is typically halfway down the quill’s length. The speed and accuracy Laaghuz has honed in his years fending off smaller birds is truly exceptional; capable of snapshotting a seagull midflight at 200 meters, or 650 feet. And accurately striking fish leaping out of the water at a kilometer out, or 3,200 feet. The quill is doubly capable of piercing and spinning through water to depths upwards of 100 feet. While Laaghuz has not practiced against draconids, and mileage on accuracy and penetration may vary there; he is a surprisingly dangerous shot with his quill. And, while the quill itself may not be dangerous, the contents that spill into and out of the quill will slowly paralyze the pierced muscle and any attached to it, as well as leaking out pheromones for Laaghuz to trace. The extent of this tracing can go upwards to a practiced 40 miles, twice the range of a bear's own sense of smell, though it is theoretically indefinite in range, as Laaghuz only needs to pick up a trace of the scent. The trace is rather accurate, as this ability was honed in the labyrinth of Laaghuz’ lair. Of course, this paralysis has worked primarily on animals who typically die from being pierced by this quill, so its affects on larger Draconids may vary. The paralysis does work rather slowly(5+ posts). It also stains the muscle and affected limbs ink-black or brown. While the substance feels much like flame, yet the expulsion of the breath attack snaps out like a strike of lightning with a doubly, echoing, thunderous roar. The reason behind this is due to the delayed ignition of Laaghuz’ breath; first nodules at the back of his maw shoot out highly voltaile gases brewed in his belly, then, with a click, two unique incisors at the back of his mouth snap together and cause a spark which ignites the line of flame in a rather eratic and dazzling manner. This flash of flame transfers about 1,088°F of heat per strike, and the flash of flame can be cast out rather rapidly (1 every post), but it needs the exuded gases first. (1 post of prep/gas saturation). But, as mentioned, this flame spreads almost instantly in the affected area. The noise is often like that of a stone clicking against stone, due to the striking incisors. Followed by a signature snap of lightning and thunder as the flame ignites; this is tell has often kept Laaghuz from using the flame while hunting. Laaghuz is capable of regrowing his limbs relatively quickly, as well as 80 feet of his tail, over the span of some weeks(2-4) for his limbs, or months(2-4) for his tail. However, this requires Laaghuz to entire a deep hibernative state where he must have eaten enough food for the regeneration to take place. The required food often distends his belly, (489,000 calories, or 1 large brown bear, or 6 humans, or 2,008-3,443 salmon, or 122,250 white mushrooms, or 1 kilogramme of sea moss). Laaghuz is also capable of forcing rapid regeneration of hands or horns via Induced Hyper-Metabolism, though this inefficiently burns through his energy and takes some time for one hand (5+ posts) and leaves him tired, but not exhausted. Of course, if he keeps at it he’ll be exhausted, or worse, faint. This also requires Laaghuz to have eaten well beforehand. He is typically poignant about his diet, but in an extended battle or if he’s caught unawares, he is severely disadvantaged. Exhausting Bite : A touch more powerful than Laaghuz’ Following Quill, his bite is capable of inducing a level of slow acting(3+ posts) paralysis that manifests in growing exhaustion of the enemy. If he bites a location struck by a Following Quill, or if he bites the same location repeatedly, the level of paralysis jumps in intensity. This bite is only applicable as long as his frontal incisors, or his rear incisors(located just in front of his molars) enters the flesh. Perfect Low-Light Vision : Both, due to nature and nurture, Laaghuz is capable of seeing perfectly in low-light locations up to 3,200 feet ahead of him and he can make out shapes upwards of 10 to 30 miles (est. distance the human eye can see), though he cannot see into pitch-black, he is capable of making out shapes with even the smallest of sources within 1,000 feet. While the primary purpose of Laaghuz’ third eye is unknown to him, he does know that its startlingly consuming black void is capable of giving most mundane creatures quite the fright. It doubly acts as a conduit for magicks when it is open, intentionally or unintentionally. And not just for him. Magic, friend or foe, within 100 feet of Laaghuz, becomes stronger. This eye is capable of much more, though Laaghuz does not know how to rightly utilize it yet. Innately, if one does look upon this eye, they may find themselves seeing illusions; from the grass turning pink, to the sky turning red, or Laaghuz’ making a strike that isn’t there. Of course, this ability doesn’t work on all Draconids; those of strong will or purpose can see through it. Great Eyesight : Due to his hunting of fishes in various states of water from muddy to tumbling seas, and his distaste of feathered fiends, Laaghuz has been both born with and trained his eyes to see clearly up to a mile out, before things turn into indecipherable shapes. Dexterous Digits : Laaghuz has spent years molding clay, cultivating fungus and crops, and cutting his quarry. His hands are more than capable of navigating and powerfully pinching at even the hairs of a spiders abdomen. Strong Claws : Laaghuz has spent many years clawing and chipping away at rocks in a rather inefficient manner, but his genes have rather clearly imbued his claws with the capacity to tear through stone. And from stone, scales are not far behind. Enduring : Despite Laaghuz’ thanatophobia, his life in his Labyrinthian Lair has kept him constantly moving and on his toes. Thanks to his long and large lungs and training, he is capable of staying in the longest of fights, and enduring the harshest of wounds. Quick : Food was rarely easy to come by, before Laaghuz made his small farms of fungus and mushrooms, so he learned to hunt and fish. But, as a welp, he was hardly capable of taking on the larger beasts in the caves; he was forced to hunt moles, rats, bugs and birds at first. These creatures are frightfully quick, so Laaghuz became quicker in kind. Sensitive Eyes : Years in the dark have left Laaghuz’ eyes sensitive to light. Broad sunlight pains his eyes, and he is forced to squint even on gloomy days. His eyesight will surely suffer if he lingers too long. Weak Scales : Due to Laaghuz’ prolonged (seemingly unending) growth, his scales will never fully catch up with the rest of his person. And where there are scales, they are only capable of effectively fending off attacks from mundane beasts like bears and the like. Frail : While Laaghuz was born in caves which collapsed frequently; he was never caught by them, and his bones have proven themselves rather frail. Just as well, his over reliance on herbal remedies has left his immunities a bit wanting where others are strong. While he has a strengthened resistance to most poisons due to experimentation with bad mushrooms and mold, he is prone to simpler illnesses like coughs, colds, and fevers. Fighting Style: Reflexive, Counter-momentum. Earth, and Sea. Laaghuz prefers fighting up close and on the ground, if he must; his ranged attacks revolve around bringing down aerial combatants and slowing creatures down for him to catch. Laaghuz strikes when his enemy misses, and when he strikes, he strikes hard as a mountain before fleeing like waves of the sea. His strategies for fighting are borne more from survival than true training, so against an experienced fighter, he will no doubt fall for feints and miss often. However, he is practiced in brawling and ambushing in the Dark, especially in tunnels. He has learned how to fight without the need of his eyes, but he has yet to truly master the technique. Magic: Laaghuz cannot cast magic unless his third eye, The Eye of The Liar, is open. Wingless Flight : Laaghuz is capable of moving without the need for wings, by manipulating the air below him. While he’s only done so accidentally, with training, he could reach respectable speeds in the sky. But he will always find it a bit discomforting. Move Stone : With enough focus, Laaghuz can move stone. Push, pull, the stone can only be made from existing elements, and not manifested from nothing. Unpracticed, he can only manipulate a 50x50 foot square rather slowly. Though he can shape and move it to help shield and lift himself, should he need. This stone will fall if Laaghuz stops focusing on the affected area, and if it is not connected to anything, it will collapse. Manipulate Flame : A bit of a subconscious habit, Laaghuz is capable of acutely manipulating flames. While he has only manipulated simple campfires and the like, the dexterity and sharpness of control is truly impressive; capable of rendering simple animal shapes with the flame. Manipulate Water : Much like the others, Laaghuz has only dabbled in this process by virtue of accident and habit; he is capable of making waves in a storm stop entirely, at 100 feet distance in a 80x80x80 foot square. Combined with his Move Stone, he is able to clear muddied waters as well. For all his Manipulation, the extent of each seems frightfully limited to his training and capacity to focus. Sorry for the delay! I'll try and get this going asap! Quills: So it only paralyzes the area it hits, like the arm? How long does the paralysis last? Snap flame: (HTTYD I see! ) Is the gas coloured? Exhausting Bite: Again, duration of paralysis? Ok, so Sensitive eyes and good eyesight is a good match for weakness/strength, I like that. However, the base for character creation is at least matching the number of strengths + 1 for weaknesses. Since there are at least 5 strengths, you would need at least 6 weaknesses. You also have a lot of abilities, from water manipulation, stone manipulation, fire manipulation, air manipulation, paralyzing darts, paralyzing bites, fire-breathing, limb regrowth, and an illusionary magic. I think you are trying to throw too much into one character. Everyone needs to have a balanced character for the fairness of the site, and I think you are unintentionally trying to give Laaghuz something of everything, which would easily make them overpowered. I suggest you cut/weaken some abilities to make a more balanced character, and add some more weaknesses to balance the strengths, as you currently have great weaknesses, just the numbers don't match strengths +1. Bump when you have made changes, or feel free to pm me on the site or dm me on discord for assistance/questions!